On 17 August 2017, Younes Abouyaaqoub, a young Moroccan member of the Islamic State, rammed his van into dozens of passers-by on the Rambla, the most famous and tourist street in Barcelona, ​​causing 16 deaths (including two Italian nationals) and over a hundred injured of 18 different nationalities. From 2009 to August 2017, at least 107 attacks involved the use of vehicles (cars, vans, earth-moving machinery, etc.). Most took place in Israel and in the Palestinian Territories, however, causing a limited number of fatalities (about a dozen). It is, actually, a tactic used since the seventies, but has only been taken into consideration by international media in the past few years. In addition to having grown more frequent (2 in 2009 compared to 24 in 2016 and 22 in the first 8 months of 2017), these attacks have caused an increasing number of fatalities (86 people died in the Nice attack alone), and this is a sign of terrorists being now more accurate in selecting their targets and executing the attacks. In the past few years, jihadist propaganda channels have been increasingly calling on jihad supporters to resort to attacks of this type, as well as providing logistical/operational instructions to enhance attack lethality and maximise material damage and psychological impact. As early as in 2010, the Al Qaeda magasine “Inspire” described vans as potential “mowers” and urged Al Qaeda’s followers to use them to “take down the enemies of Allah”. Such appeals have become even more frequent with the rise of Daesh, a group promoting “widespread participation” in terrorism and the spontaneous initiative of sympathisers and aspiring affiliates so as to make up – at least partially – for the military losses in Syria and Iraq. While ideologically embodying what Olivier Roy calls “Islamisation of nihilism”, this form of headless terrorism has the use of conventional tools (such as knives and vehicles) as its most natural solution in operational terms. The tightening of regulatory and security measures in the main European countries has pushed terrorists – who know how to adapt quickly to changing operating environments – to resort to tactics requiring an ever-lower level of planning and little or no military skills. The wave of attacks has triggered lively debate, nationally and internationally, on the most appropriate measures to be taken to reduce risk exposure. The temptation is sometimes that of resorting to visible (and invasive) heightened security, through the installation of concrete blocks and other barriers to block access to high-risk areas and greater security force deployment. This is what happened, for example, in Berlin (following an attack on Christmas markets) and in other areas such as Toronto or Milan, where new jersey barriers have been erected in Via Darsena, in the centre of the city. This is an application of the so-called ‘fortress’ logic or what the Anglo-Saxons call “ring of steel”. This approach – which is effective for the protection of fixed targets in out-of-town areas – fails, however, to combine security with aesthetics and function. In 2010, the Royal Institute of British Architects approved a handbook containing design solutions to mitigate criminal and terrorist threats. In other words, it is a matter of integrating the CPTED (Crime Prevention Through Environmental Design) approach with the principles of ATD (Anti-Terrorism Design), which have long been considered incompatible. In practical terms, this approach means, for example, creating chicanes to slow down vehicles approaching at-risk areas, or erecting special barriers (planters or other original street furniture elements) to absorb the kinetic energy of vehicles driven at high speed to potentially cause damage (reliability tests should anyway be run on such barriers or chicanes based on specific technical regulations). Security measures have to be perfectly integrated into the urban fabric and not spoil its aesthetics and function. As stressed by the above handbook, “if design retreats to a bunker mentality (…) there will be a greater sense of alienation from all corners of society, including the disaffected and radicalised (…) An essential approach to the design of buildings and the spaces between them will incorporate counter-terrorism measures in a discreet and proportionate way”. This multidisciplinary approach meets the need for the authorities to timely and properly assess risks, an essential requirement for an effective security plan. Both the terrorist attack in Barcelona and the ones in Nice (on Bastille Day) and Berlin show how local authorities failed to perform proper risk assessment or even failed to assess risks at all. In the first case, the van hired by the terrorists was able to travel, nearly undisturbed, about 600 metres along one of the main tourist routes of the city; as to the other two cases, the attacks were carried out on occasions in which it was reasonable to expect heightened security. 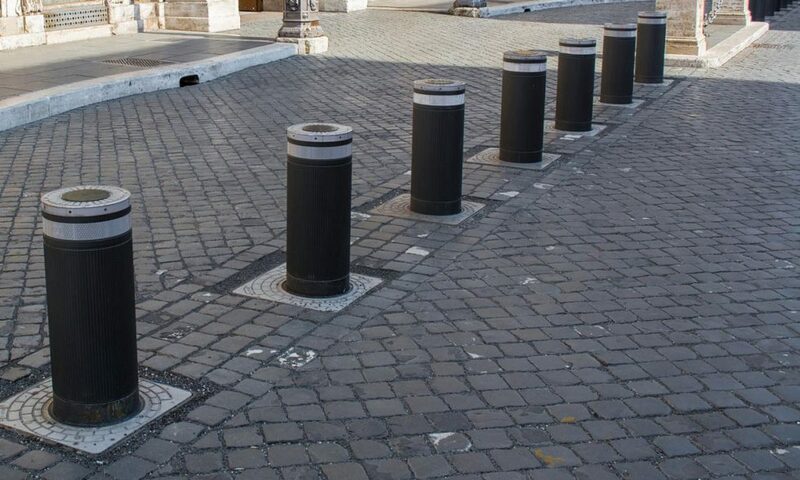 In various European areas (including some of the main Italian cities), ad hoc steps have recently been taken in symbolic places and crowded areas, generally through the erection of barriers (bollards, jersey barriers, etc. ), changes to urban road plans and provisional measures such as the use of vehicles as barriers. However, countering the threat of terrorist attacks (carried out with the use of vehicles or other tactics) requires a holistic, technical and multidisciplinary approach, to be defined, for example, by working groups involving architects, engineers, law enforcement agencies and anti-terrorism experts. Such groups should be tasked with defining guidelines to be disseminated, shared and implemented at each level of local and national administration. If the threat is global and pervasive, response must necessarily be unequivocal and thorough.